Taytu Betul (Amharic: ጣይቱ ብጡል? c. 1851 – February 11, 1918) (baptismal name Wälättä Mikael) was an Empress Consort of the Ethiopian Empire (1889–1913) and the third wife of Emperor Menelek II of Ethiopia. She founded Addis Ababa, Ethiopia's capital city. aytu Betul (or Taitu) was born in or around 1851, the third of four children in an aristocratic Ethiopian family that was related to the Solomonic dynasty. Her father, Ras Betul Haile Maryam was less well known than her uncle Dejazmach Wube Haile Maryam, who was the ruler of much of Northern Ethiopia in the 1840s, and a rival of Emperor Tewodros II. Her father's family were the ruling family of Semien province, claiming descent from Emperor Susenyos I. Her father is son of Ras Gugsa, a member of the powerful ruling family of Yejju, which was of Oromo origin and had converted to Christianity from Islam, and which had ruled as Regents for the powerless Emperors in Gondar during the Zemene Mesafint ("Era of the Princes"). Taytu's mother Yewubdar was from a minor noble family of Gondar. Taytu had the reputation of being fiercely proud of her lineage in Yejju, Semien and Begemder. After four failed marriages, Taytu Betul married King Menelek of Shewa, later Emperor Menelek II of Ethiopia. 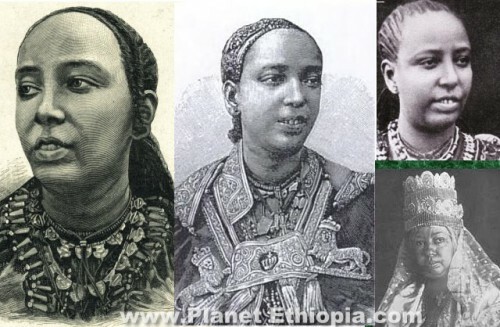 Taytu is acknowledged to have wielded considerable political power as the wife of Menelik, both before and after they were crowned Emperor and Empress in 1889. She led the conservative faction at court that resisted the modernists and progressives who wanted to develop Ethiopia along western lines and bring modernity to the country. Deeply suspicious of European intentions towards Ethiopia, she was a key player in the conflict over the Treaty of Wuchale with Italy, in which the Italian version made Ethiopia an Italian protectorate, while the Amharic version did not do so. The Empress held a hard line against the Italians, and when talks eventually broke down, and Italy invaded the Empire from its Eritrean colony, she marched north with the Emperor and the Imperial Army, commanding a force of cannoneers at the historic Battle of Adwa which resulted in a humiliating defeat for Italy in March, 1896. This victory was the most significant of any African army battling European colonialism. Menelik, who often prevaricated and postponed unpleasant decisions with answering "Yes, tomorrow" (Ishi, nega), found it useful to have his wife be in a powerful enough position to say "Absolutely not" (Imbi) to people and issues he just didn't want to personally offend or refuse. As a result, Empress Taytu was increasingly unpopular while Menelik remained very loved by one and all at court and beyond.